Alright primary teachers, this counting song is for you! 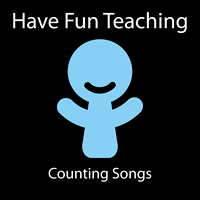 The Counting Down From Twenty Song from Have Fun Teaching will have your kids singing, dancing and moving around the room as they learn how to count from 20 to 1. This counting song is fun for kids as it provides a fun beat for dancing as well as having the kids stand up straight without moving a muscle! Description: Math song that teaches counting down from twenty. This song will teach students how to count down from 20 to 1. This is a song for learning how to count down by ones from twenty to one.